Buíochas le Dún Laoghaire-Rathdown County Council as ucht an fógra “Géill Slí” seo i dTrimleston i mBaile an Bhóthair. 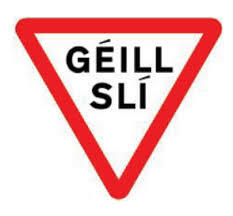 Thanks to DLRCoCo for replacing a rusty “Yield” sign here, with a new “Géill Slí” one. Nice to see our national language in practical use.